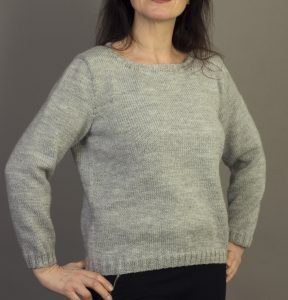 A Simple loose fitting sweater with a wide crew neck and set-in sleeves, great for many occasions. Just throw it on with a pair of jeans or leggings, and go! Any double knitting (light worsted) yarn that knits to a gauge of 22sts and 28rows can be used. The main body of the garment is worked in stocking stitch, with double rib edgings. 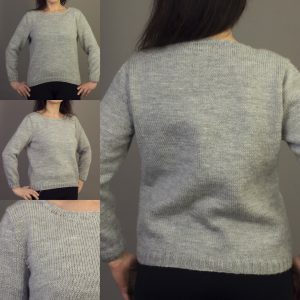 The neckband is also worked in double rib.